Have you encountered any situations where client climbers are Islamic, Mormon, Christian or Jewish (monotheistic) and will not participate in the puja ceremony? If so what sort of issues does this cause, if any? Those of you who have been following this blog for a while might be forgiven for thinking I’m not a very religious person, and probably not someone best-qualified to comment on spiritual affairs. I don’t know why on earth you might think this, but just because I have a tendency to indulge in irreverent banter from time to time it doesn’t necessarily mean I can’t address more earnest matters. So I had a think, picked up my more serious keyboard and typed out a response which I hoped would address the question without making me sound too much like Richard Dawkins. 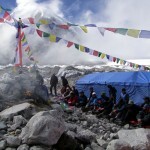 The puja ceremony is an essential part of any mountaineering expedition in the Himalayas using Sherpa support. The Sherpas follow the Tibetan branch of Buddhism incorporating much of the animist Bon religion prevalent in Tibet before Padmasambhava introduced Buddhism there in the 8th century. They believe the summits are the abode of mountain gods who must be appeased before setting foot on the mountain. Prior to the ceremony they build a platform out of rocks in a prominent location at base camp, containing a small furnace for burning juniper branches and incense. During the ceremony a lama (monk) chants mantras and makes offerings to ask the mountain gods for safe passage during the climb. 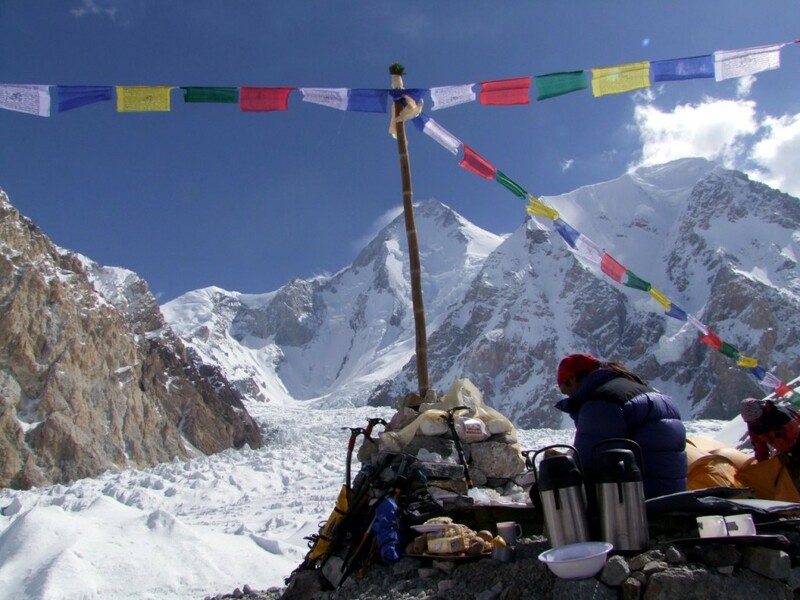 Mountaineers bring all their technical equipment, such as ice axe, boots and crampons, and put them beside the platform to be blessed during the ceremony. Towards the end a flagpole is erected on the puja platform and prayer flags are draped from it to all corners of base camp like spokes of a wheel. Rice is thrown into the air three times (an auspicious number) to the cry of lakalu, which means “victory to the gods”. This indicates that far from “conquering” the mountain, a term western mountaineers are increasingly ceasing to use, we are allowed to climb it only with the permission of the mountain gods. I’ve taken part in many puja ceremonies, some without monks (when our Sherpas have had to argue amongst themselves who should play lama), some with very laid-back monks who have joined in with the naturally playful antics of the Sherpas, and some with very austere monks who have taken the ceremony very seriously. I even attended one where the kitchen boy was a trainee lama, so he did the chanting for us. 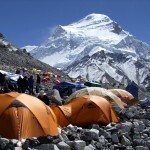 What has been common to all of them is a very calming atmosphere across base camp. 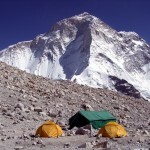 Nothing illustrates this better than the following footage, in the spectacular setting of Gasherbrum Base Camp in the Pakistan Karakoram, with 8068m Gasherbrum I rising overhead, the world’s 11th highest mountain. I’ve never encountered anyone refusing to take part in a puja, and I would be surprised if it happens, the reason being that if the ceremony didn’t take place then the Sherpas wouldn’t climb. Most of us don’t believe in mountain gods, but whatever our spiritual beliefs, we all know a happy Sherpa team increases our chances of summit success. 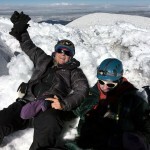 The Sherpas are a very tolerant people and it’s possible they wouldn’t mind if someone declined to join in. 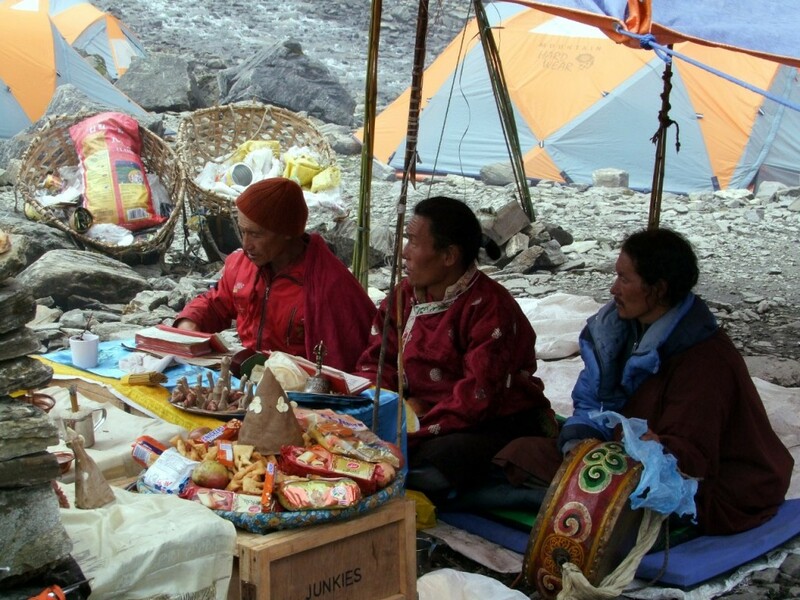 For example, anyone who’s ever taken part in a puja will know that Sherpas love alcohol, and it seems to form an important part of every ceremony. While I’ve never encountered a climber refusing to take part in the ceremony, I’ve seen many instances of climbers refusing to drink alcohol, and the Sherpas are not offended by this. I don’t know what would happen if someone refused to take part altogether, whether the Sherpas would refuse to climb with them. 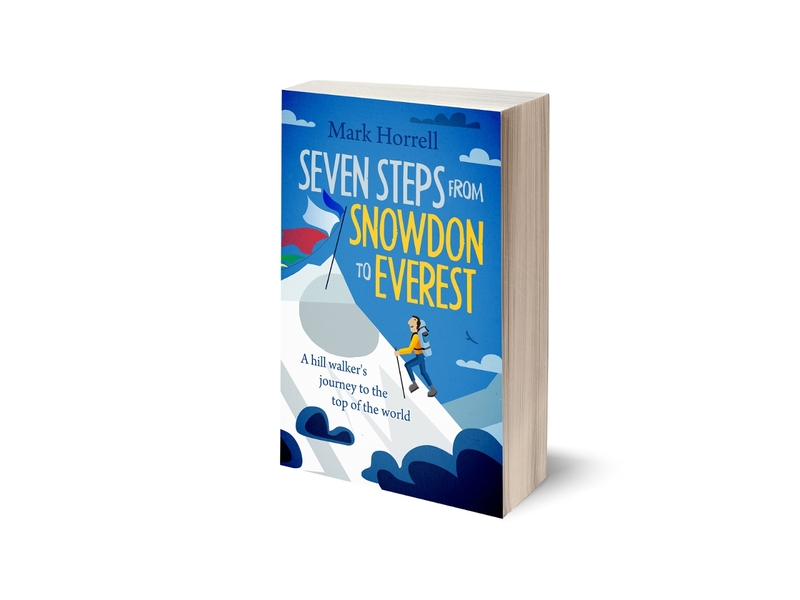 More likely they would get stick from their team mates for upsetting the Sherpas, for whatever anyone may say, successful expeditions require team work and a strong bond of trust between climbers and Sherpas. I suppose ethically if a person can’t bring themselves to take part in a ceremony to accommodate the spiritual beliefs of the Sherpas, then they should consider climbing without them, but that’s just my view and a more religious person than me may disagree. There’s another reason why I think it unlikely a mountaineer would refuse to take part in a puja. While we may not believe in mountain gods, most of us are experienced enough to realise summit success is dependent on forces beyond our control, and whatever our spiritual beliefs the puja is an opportunity to reflect on this, whether that’s praying to whatever god we believe in, keeping our fingers crossed for good luck, or focusing on what needs to be done and telling ourselves not to do anything silly. What do you think? Have you ever been to a puja where someone has declined to take part, and how would you feel if they did? Anyway, all this talk gives me another excuse to show this video of our puja at Everest Base Camp last year, when alcohol played a VERY important part, so much so that it was The Puja to End All Pujas. Surely, given your background as a chorister, we should have assumed you to be thoroughly at one with your spiritual side? Thanks, Alan. Nice to know you read my blog. I agree with you, I’ll take all the help I can get. It’s interesting to hear there are people who don’t take part, though I’m not surprised to hear the Sherpas didn’t object. Ah yes, the Gondogoro La – I was intending to cross it myself in 2009 but there was a storm and we returned via Askole instead. The mountain gods must have been smiling on you, as I understand it is not easy! Gondogora La is a challenging pass. It happens, I did it with running shoes, but I’d not recommend anyone to ignore crampons.